While many people are familiar with wild bachelor parties, they fail to realize that many wild bachelorette parties are also planned. Adventure-seeking brides everywhere enjoy a wild and crazy evening just as much as the men in their lives do. Strip Workout Class: Learn how to turn up the heat by taking a strip aerobics class. These classes are fun for everyone, and no one needs to actually get naked. Many classes encourage wearing layers so you can still "strip" without worrying about losing your clothes. An athletic group might even consider taking a pole dance class at a dance or fitness studio. Extreme Sports: Daring sporting parties are a great gift for the bold bride-to-be. Whether it involves sky diving, hang-gliding or rock climbing, an adventuresome bride is sure to love this wild idea for her bachelorette party. Motorcycle Road Trip: A road trip with the girls to Las Vegas or Atlantic City is nothing new. Take it to the next level by turning the standard trip into an exciting journey by getting your motorcycle licenses and renting Harley Davidsons for the trip. Motorcycle touring trips, through various touring companies and bike companies, are also available. Naughty Bachelorette Scavenger Hunt: Bar-hopping is a common theme for bachelorette parties, so add a naughty scavenger hunt to the evening and turn it into a risqué romp. Divide girls up into teams and send everyone out to collect naughty items on the list. Take photos of the bride doing shots, getting kisses on the cheek from college students or dancing with someone's dad - the list of crazy things to get or do is endless. Just make sure none if it is illegal or worthy of getting banned from the bar. Not only should you keep the bride's preferences in mind when planning the party, you should consider who is on the guest list as well. After all, the mother of the bride may not be up for taking a strip class with her daughter and friends. Make sure you go over exactly what is too wild and too mild with the bride before you plan the party. If you are throwing a sporting event or something physically challenging, consume alcohol after, not before. This will keep everyone safe. Make sure you have someone who is properly trained leading everyone in whichever activity you have planned. When someone goes too far or starts getting too crazy, call them a cab to take them home, even if it is still early. Hire a driver or ask someone to serve as a designated driver to keep everyone safe when going home from the party. A night of fun debauchery is often what a wild bride wants before she walks down the aisle. 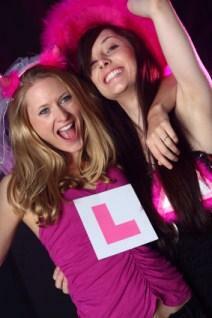 Give her a one last thrill as a single gal by planning a wild bachelorette party. On the other hand, if the bride-to-be wants to keep things wholesome or invite underage cousins and sisters, there are plenty of clean bachelorette party ideas to try.